Impressive battery life time up to two hours. Integrated with SONY IMX377 Image Sensor for precise and clear image details. Built with 12 megapixels to capture light as much as possible to deliver quality footage. Compact and portable that makes this action camera a great choice for beginners and travelers. Affordable, yet packed with ton of cool features that gives you flexible options. Ergonomic design for comfortable grip and easy to use. Ever want to create videos of your own traveling experience with the audience and mount action camera with one of these drones such as the HS700 Ophelia? You have come to the right spot. 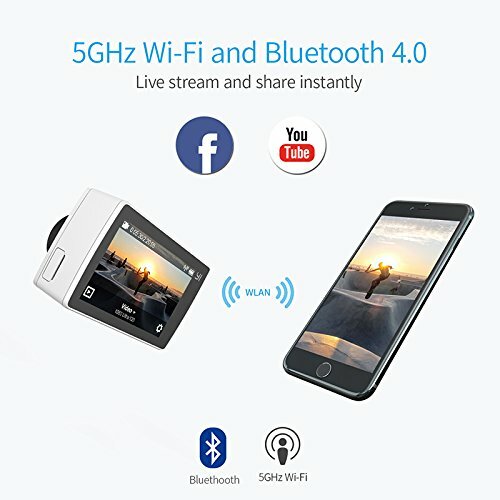 If you are going to create videos and stills, you will need to have an action camera that can deliver high quality resolution to capture your audience attention. Fortunately, the YI is well known for manufacturing top-notch action camera quality. Meet the YI 4K Action Camera, the most portable and inexpensive sports action camera yet. All these waiting are finally over and you can get your hands on it. That is what we did at least and tested this action camera. 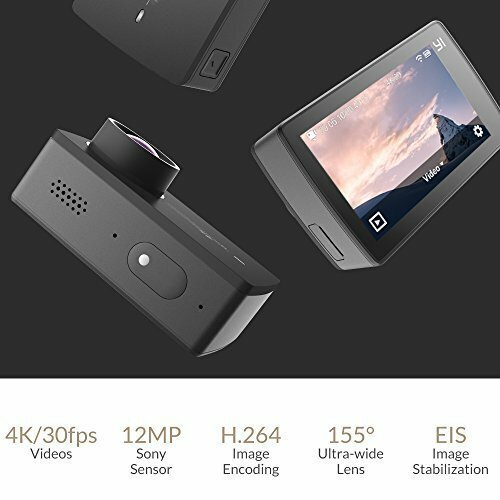 We are more than excited to share what we have to say about the YI 4K action camera. So without further ado, let’s dive into the review and find out if this is the action camera that you have been waiting for! First of all, the YI 4K action camera features an ergonomic design that focuses on making it compact and simple enough for beginners as well travelers. It doesn’t comes with too many buttons that clutters up the action camera. Instead, it is made to be plain simple yet capable of delivering amazing high quality videos and stills at 4K resolution setting. 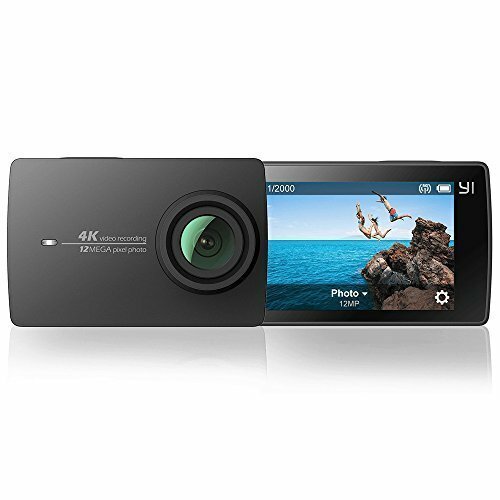 The YI 4K action camera features a compact body dimension of 2.2 inches that you can easily store inside your travel case or a jacket’s pocket. I really liked how it is designed with power LED lights located at the front. Because of the way this action camera is designed, it prevents you from making mistakes with fat thumb. Allowing you to create videos and stills whatever you want to. Another major design feature is a complete and responsive touchscreen. 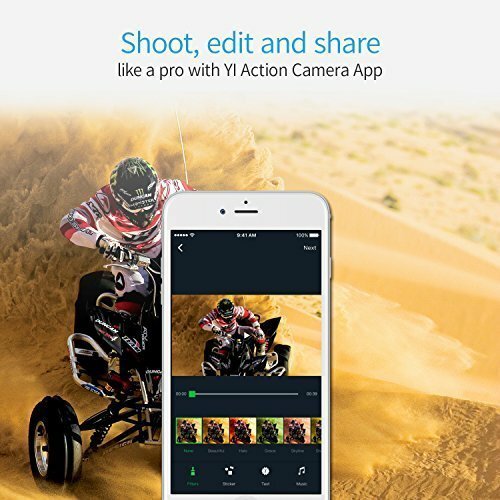 The YI 4K action camera features intuitive touchscreen UI that displays image at 640 x 360 high-definition resolution that makes it easy to change setting, previewing images and even shooting. 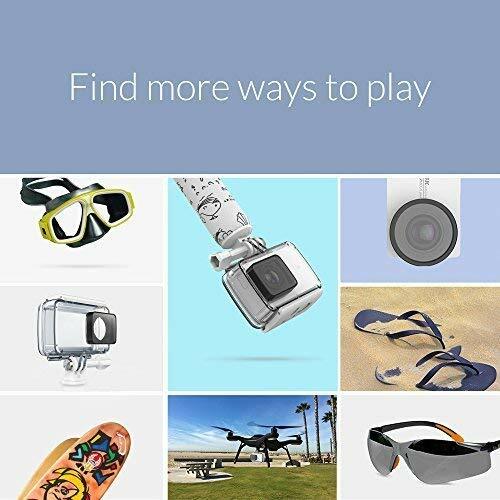 Best of all, this sports action camera is equipped with voice command that makes it easier for you to capture image footage without having to lift a finger. Like many of us, we definitely don’t want to have scratch on our action camera. Which is why we are happy to share the news with you that the YI 4K action camera features Gorilla Glass Retina that resists scratches and daily impact. This gives us a peace of mind carrying the action camera with us wherever we go without having to worry about nicks and scratches. 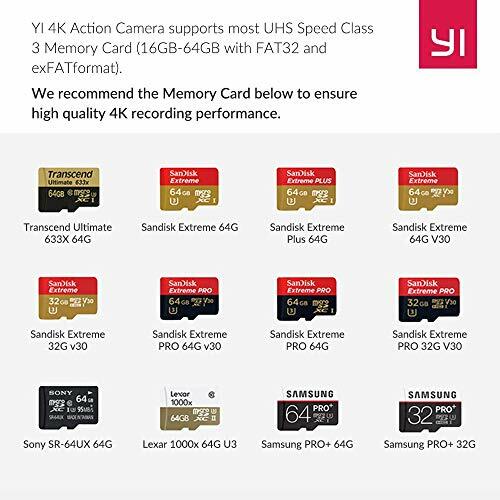 The YI 4K action camera comes with an impressive battery capacity. It can operate for up to two hours each single charge. Thanks to its built-in high performance cooling systems that keeps the action camera cooled while running for extensive periods. Most action cameras that you usually find for less than $50 aren’t equipped with cooling systems. That’s what makes the YI 4K sports action camera a clear option over other similar products. Because of its superior cooling systems, I was able to run the action camera for almost two hours straight without a break. This makes it a perfect choice for capturing special moments while running the action camera continuously. Thanks to integrated 12MP 1/2.3″ CMOS sensor, the YI 4K action camera does an amazing job at capturing stunning shots. If you use drones that allows you to mount an action camera such as the HS700 Ophelia or MJX Bugs 3, you can definitely capture beautiful aerial shots and edit them that will capture your audience’s attention. For beginners, the image quality isn’t that bad at all. It is more than good actually and an affordable action camera for beginners. This action camera has a built-in Sony IMX377 image sensor and Ambarella dual-core for lighting fast image processing. In addition to that, it can record videos up to 4K ultra-high definition resolution at 100 Mbps. 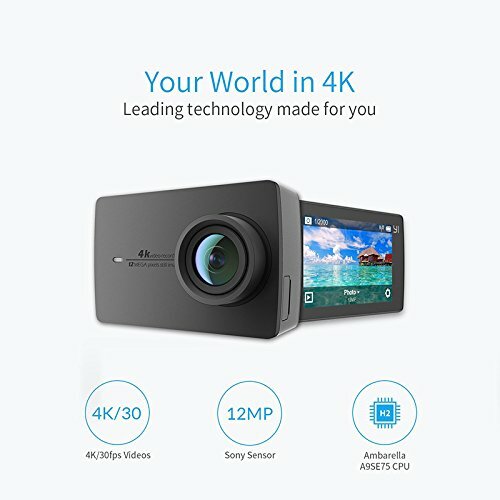 Not to forget to mention that the YI 4K action camera is equipped with advanced video stabilization that allows you to capture smooth and fluid video footage. We often think that the smaller an action camera is, the fewer features it has. But that is actually quite the opposite. As matter of fact, the YI 4K action camera is loaded with a lot of features! You can easily share images and videos via Instant Sharing feature. Thanks to the built-in bluetooth and lighting speed 5GHz Wi-Fi support for wireless remote control. You can simply share away what you captured on the YI action app. Plus, this compact sports action camera is equipped with advanced features. Enjoy the wide flexibility setting that it has to offer from ISO to Shutter speed to Meter. Not to mention that the YI 4K action camera produces raw files that let you create masterpieces even with low-light conditions. In addition to that, you can capture stills while recording videos. There are at least several ways to capture videos from burst to slow-motion and time-lapse. As we wrap up the YI 4K action camera review, I will be one of the first to say that this is an action-packed camera for beginners. It doesn’t cost too much and is somehow affordable for even budget-tight buyers. When it comes to shopping for an action camera, I think it is important to consider the factors such as the features, video quality and other aspects. But nothing beats the YI 4K action camera. It has overall a better quality in terms of resolution settings. Plus, there are a lot of cool stuff that you can do with this action camera. Such as creating time lapse, slow-motion and burst shots. It is rare for a great quality action camera to have these features. Best of all, there are plenty of ways you can share your images wireless via YI Action app. For a price tag under $120, the YI 4K action camera is definitely a great camera to start with. 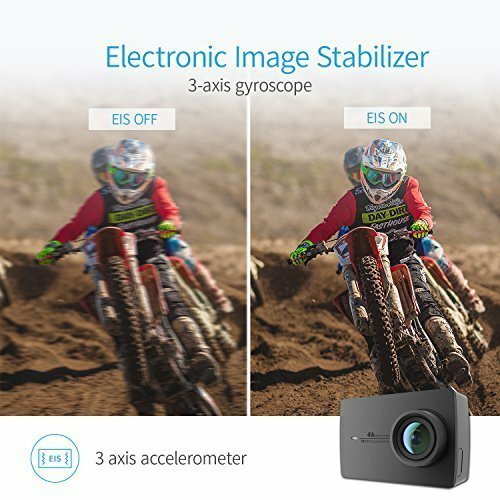 Beginners and people who are looking to upgrade their action camera should get this product. You can order one here. We also recommend that you buy a 3-axis handheld gimbal to go with this action camera if you want to have a smoother video experience. Based on the research and sifting the customers' feedback. 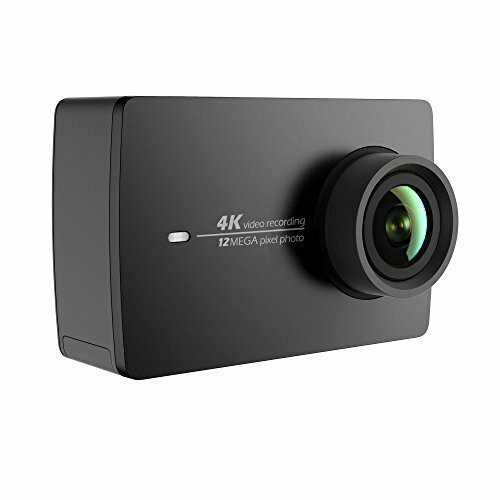 We think the YI 4K action camera is definitely a great quality action camera for beginners and everyone else who is looking to upgrade their. Equipped with amazing features and powerful image sensors that deliver pristine, clear and sharp details that will capture the audience attention. This is an action camera that will not disappoint anyone at all. HS700 Ophelia Drone Review: Best Holy Stone Flagship Ever? JJRC H68 Bellwether Review: Best Drone Under $100 for Beginners? JDRC JD-20S Review: Best DJI Mavic Air Clone Under $100 For Starters?